Make Your Selection Based on Color, Height, Care,and More! 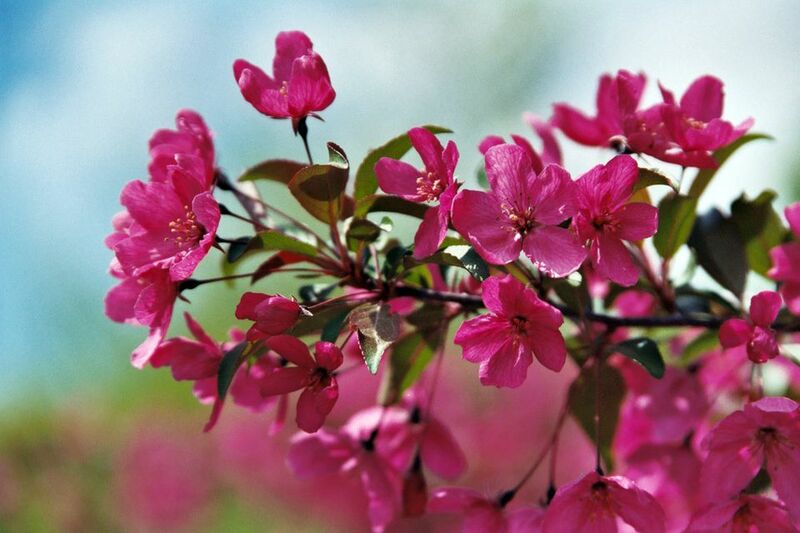 Some kinds of crabapples are fragrant trees. In choosing the best fragrant trees to grow, don't get too hung up on your image of what a "tree" is. That word may conjure up a picture in your mind of a gigantic plant that reaches to the sky, but their very height can disqualify such trees. Think about it: A fragrant flower does you little good if it's way up in the air in a place where you can't smell it. Smaller specimens carry the day over their taller cousins almost every time when it comes to bringing sweet scents to the yard. That's why some of the taller shrubs, too belong in this conversation. They're practically small trees, and your nose can easily reach the aromatic delights they have to offer. You can also train some shrubs and vines to grow as if they were small trees by removing their lower branches, thereby exposing the trunk; such creations are called "standards." 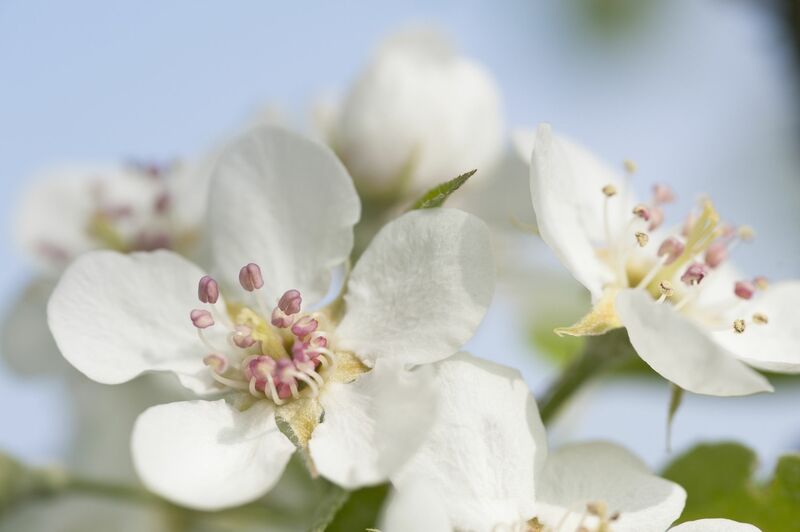 A variety of fragrant trees are presented here so that you can make your own choice based on how much weight you give to foliage, fruit, low-maintenance, enjoying a particular flower color, or growing a tree of a certain height. Even though they're technically classified as shrubs, many think of lilacs as trees and wouldn't take any list of the most fragrant trees seriously if it didn't include lilacs. Just make sure that, if you want height, you grow the traditional French lilacs (Syringa vulgaris), not more compact kinds such as Syringa pubescens subsp. patula Miss Kim (4 to 9 feet tall). French lilacs (full sun, zones 3 to 7) can get to be as big as 20 feet high, although you'll probably want to prune them to keep them a bit shorter, else your nose won't be able to reach their aromatic flower clusters. The golden racemes of Laburnum x watereri trees are bound to delight you most with their visual beauty, but they also pack a potent scent. Golden chains are like shooting stars, bursting onto the scene with incredible brilliance for a short period (spring, when they bloom) but then leaving just as suddenly (with no bonus features to take their place). So take sequence of bloom into account when planning your yard's design and be sure to complement your golden chains with specimens that are showy at other times of the year so that you achieve a four-season landscape. These 15-to-25-foot specimens grow best in partial sun and in zones 5 to 7. Since that leaves you out if you garden in South, consider growing a Gardenia jasminoides as a standard, instead. These shrubs can become 8 feet tall, essentially functioning as small trees if trained properly. This tall shrub is best known for the purple color of its leaves. Its fragrant flowers are a bonus. Prunus x cistena is a very cold-hardy hybrid plant, listed for zones 2 to 8. Locate it in full sun. It becomes 7 to 14 feet high, with a spread of 7 to 10 feet. The flowers are mainly pink when they first open; as the color fades, they become white. Albizia julibrissin is invasive in some regions, so maintenance can be high: You'll have to pull out any new plants that emerge (if you don't want them around). But if you're willing to put up with the extra care, this is a delightful plant to grow. The flowers are not only fragrant but also exotic-looking, and the foliage is also interesting. Silk trees have mature dimensions of 20 to 40 feet tall, with a slightly wider spread. Grow them in full sun to partial shade, zones 6 to 9. It's good if you wish to avoid a mess in the yard. It's bad if you're trying to draw birds. It reaches a height of 20 to 25 feet, with a spread of 15 to 20. Grow it in full sun in zones 4 to 8. Its powdery-mildew resistance is superior to that of other crape myrtles. It displays a pretty peeling bark of a cinnamon color. The latter two are the most fragrant. Unhappily, they're both invasive in North America. Any wisteria vine can be trained to become a standard. The cherry plum (Prunus cerasifera) is a tall shrub that has fragrant flowers. Although it has shorter cultivars, the species plant (full sun, zones 4 to 8) can reach 30 feet in height (remove the lower branches to give it a tree form if you so desire). Canadian hemlock is the exception on this list when it comes to choosing fragrant trees short enough for you to be able to access their sweet-smelling flowers easily. But that's because it doesn't flower: Tsuga canadensis is a conifer. The fragrance to enjoy from it comes from the evergreen needles of its branches, which you should be able to access for years, even though the plant does eventually reach 80 feet tall (and if that height is an issue, just prune it to keep it at a smaller size). As an evergreen, this plant is also great for the winter landscape. In fact, you can harvest the sweet-smelling boughs and use them in natural Christmas decorations. If appreciating heady aromas is a big part of the gardening experience for you, then you will want to leave no stone unturned in seeking fragrant options. Lesson #1 is to realize how many great-smelling plants there are that don't have fragrant flowers: It's their vegetation that has such a wonderful scent. Evergreens such as Canadian hemlock trees aren't the only plants that fall into this category. In fact, the most popular plants with fragrant leaves are herbs.